Free! 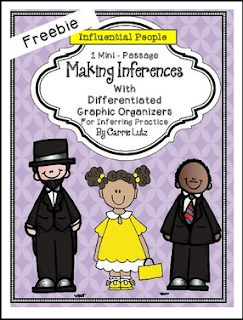 Making Inferences with Non-Fiction Mini Passages and Differentiated Graphic Organizers!Using simple text and differentiated graphic organizers, your students can learn to make inferences from high interest non-fiction texts. This is one passage from my 10 passage set. Click Below to see the entire product.